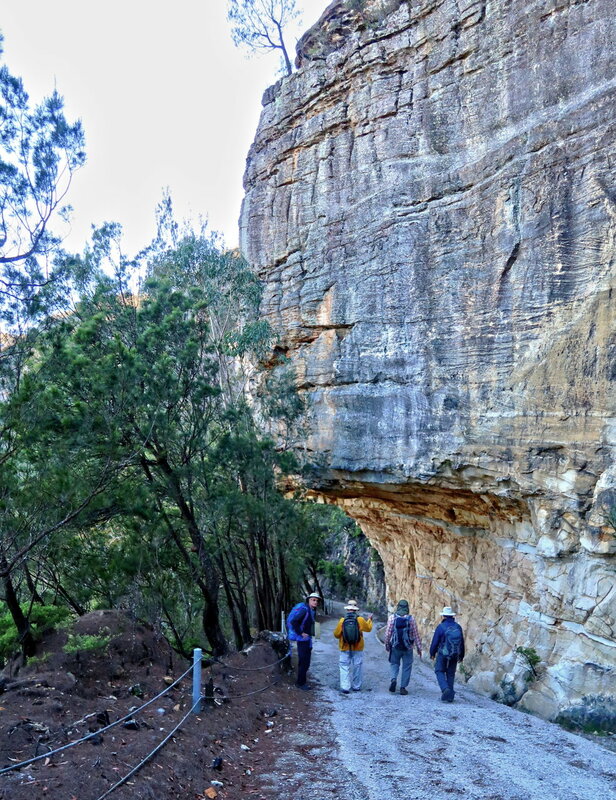 Most Sydney / Blue Mountains bushwalkers have been to Mt Solitary. 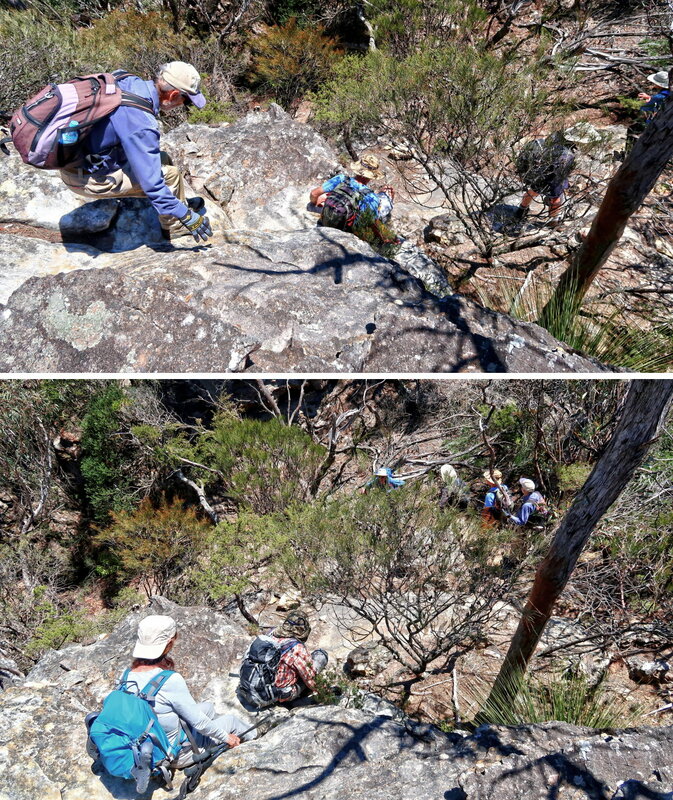 But how many have climbed down the mountain via the steep Miners Pass ? 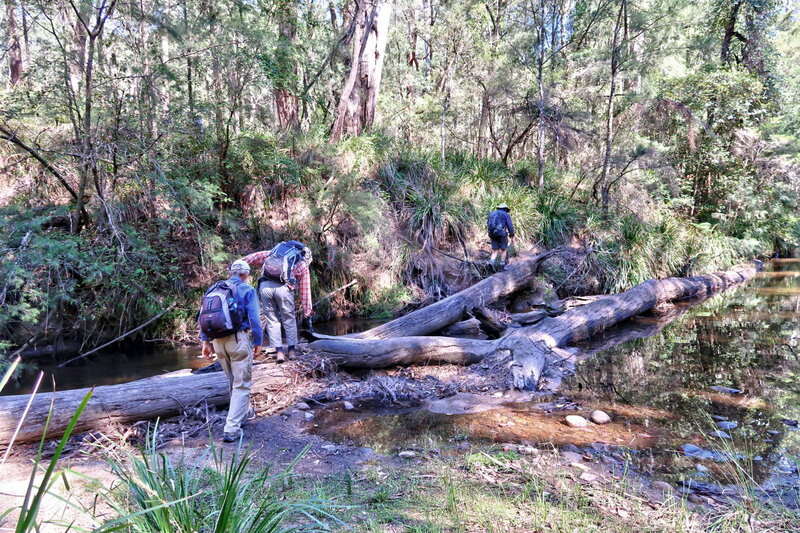 So, today, seven of us intrepid adventurers have a go at it. 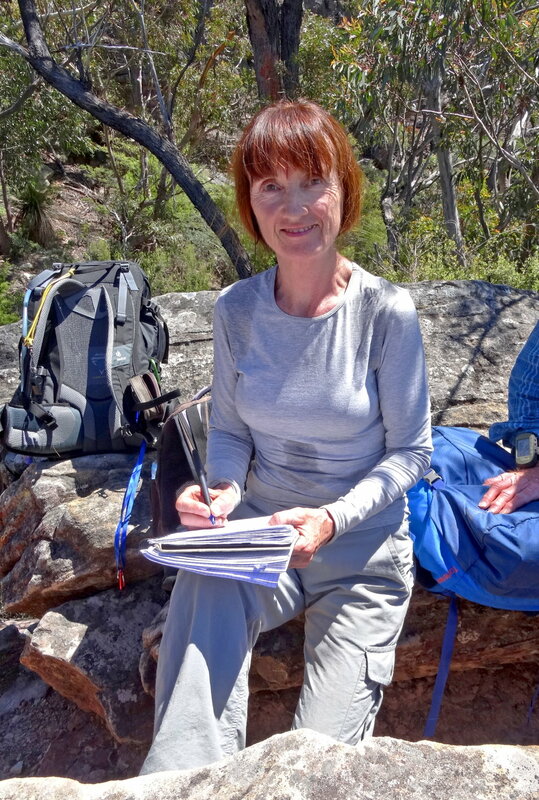 By the way, the last time I climbed Mt Solitary was 5 years ago in 2012 October. 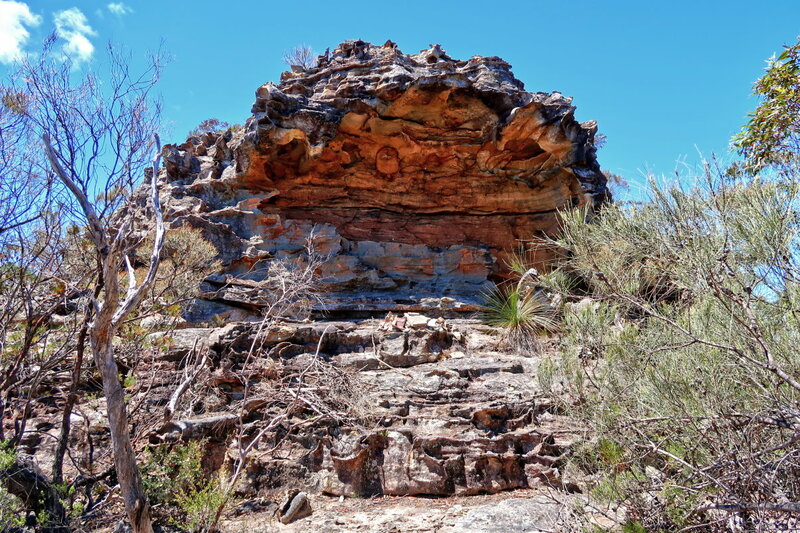 - Climbed up the same way as today, from the east, from Kings Tableland. 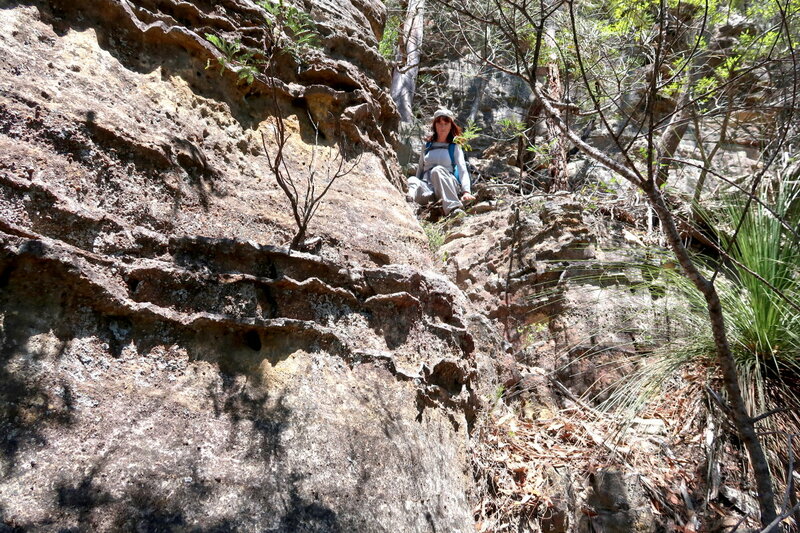 - Return trip was on the west side, via Ruined Castle, Federal Pass, then up Furber Steps to Katoomba's Scenic World. 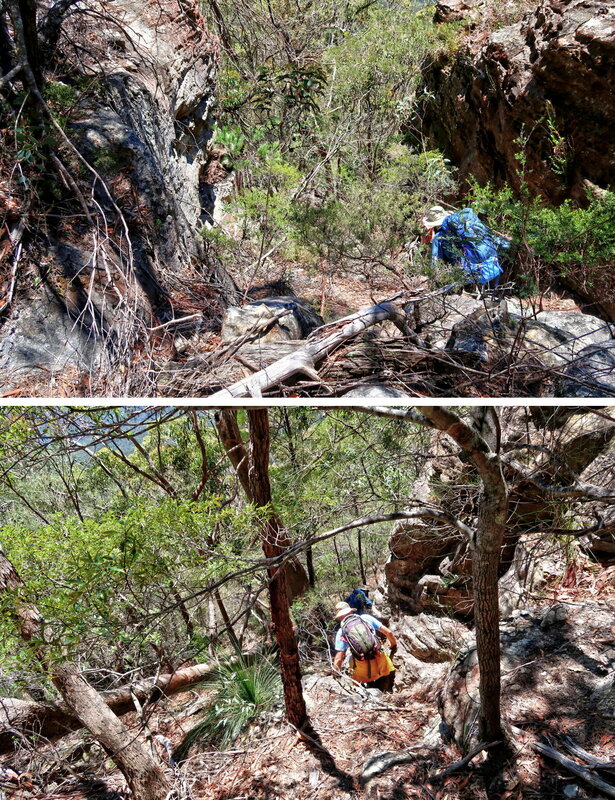 Miners Pass is a passage down the north face of Mt Solitary. 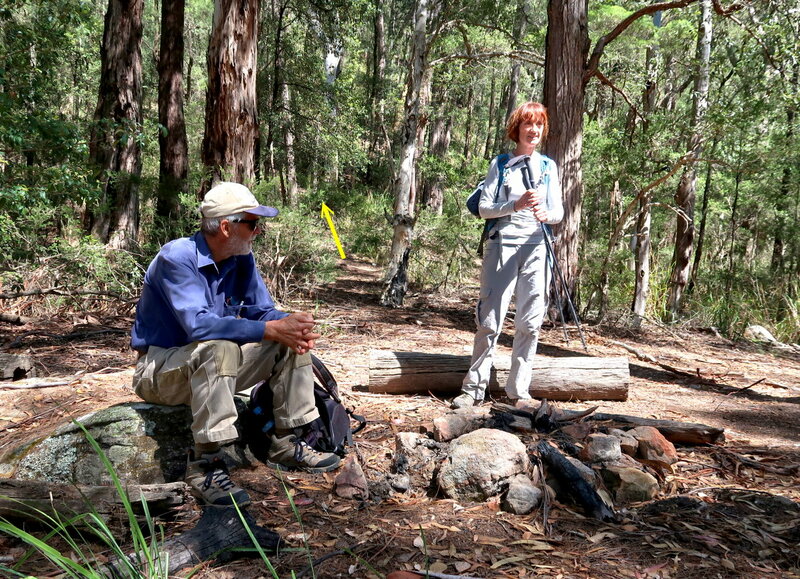 There are cairns marking the route. But you need to keep an eye out for them. 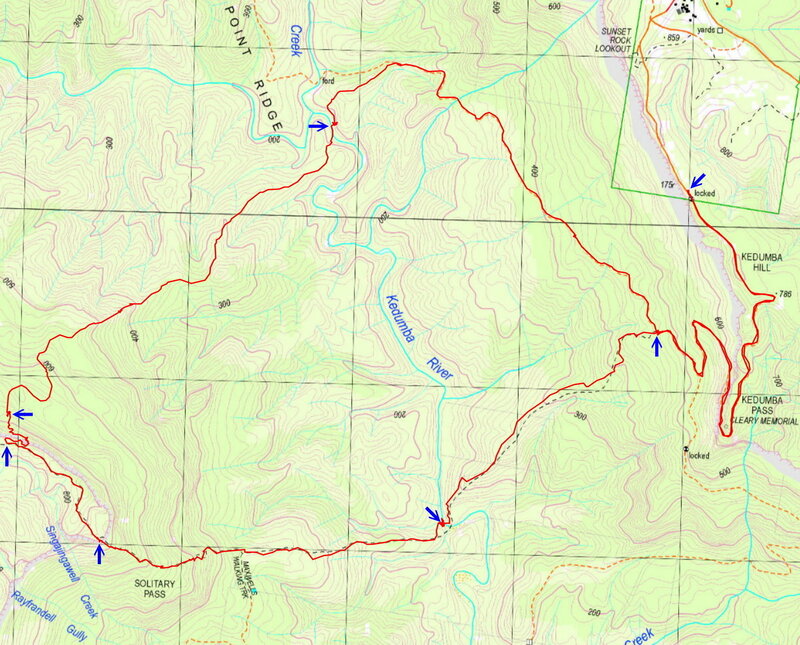 Below is our tracklog, clockwise in red, superimposed on the above 1:25,000 scaled map. 4. The Col, about 775 meters high ... There is a log book here. 7. Afternoon tea is by the side of Kedumba river, after crossing it. - Start at a carpark by Kedumba Pass Gate on Kedumba Valley Rd. - Walk on Kedumba Valley Rd. 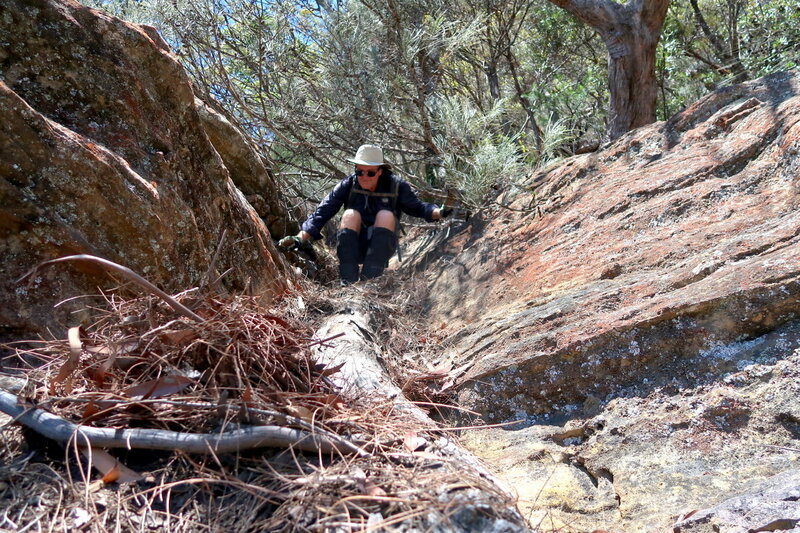 - Then turn into a foot track to Mt Solitary. 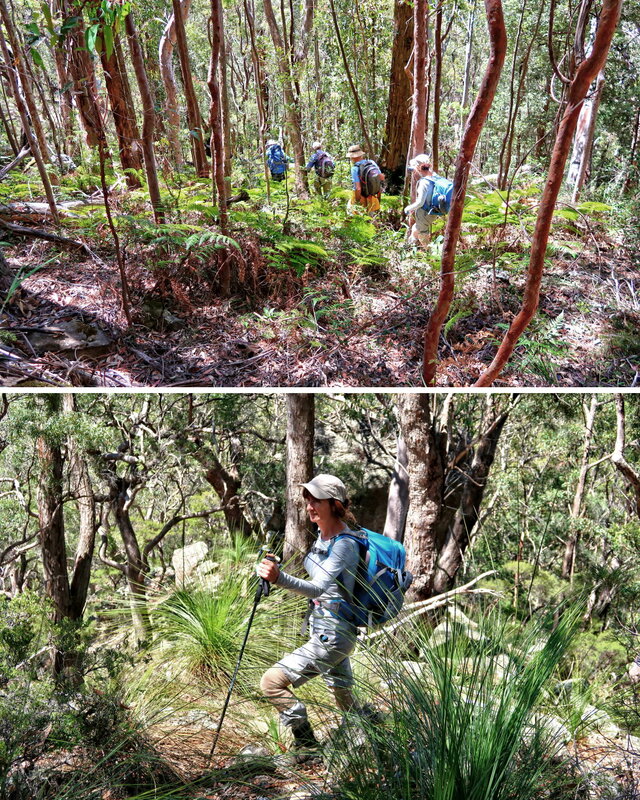 - Climb up to The Col.
- At about halfway between The Col and the 919-meter middle peak of Mt Solitary, bushbash down Miners Pass. 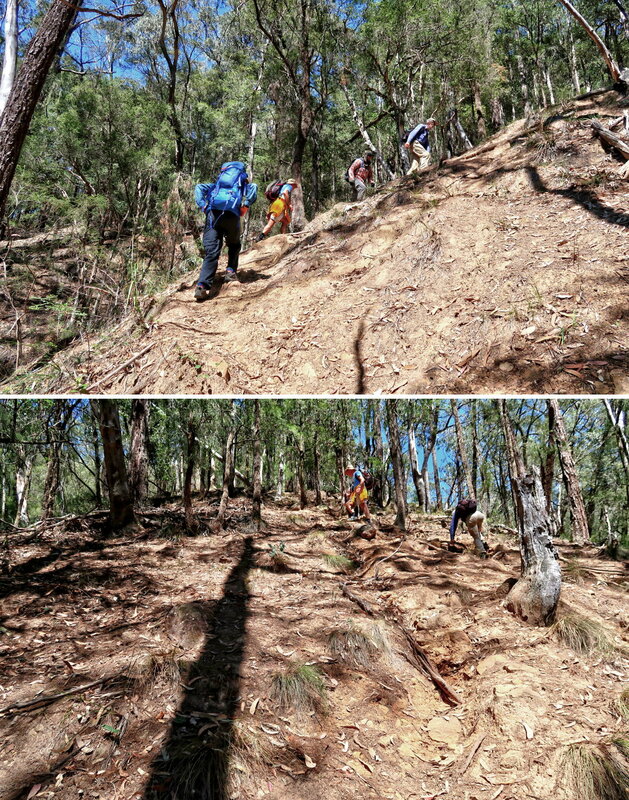 - Climb up to Kedumba Valley Rd. - And back to the carpark. 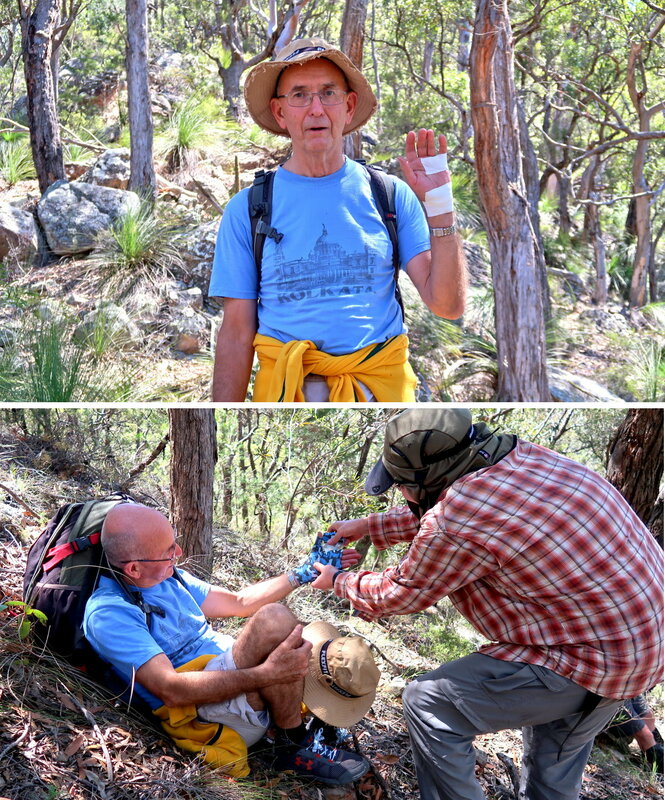 Saf bandages up NC's hand. 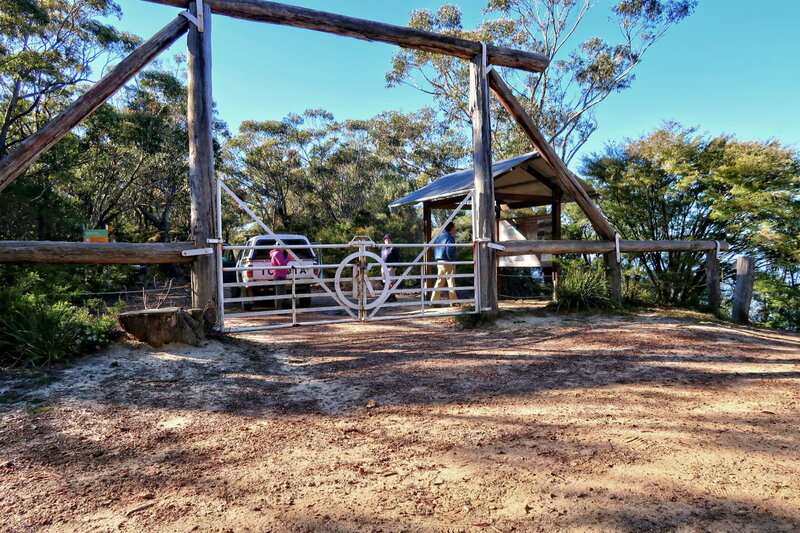 - The carpark is on the near side of the gate. 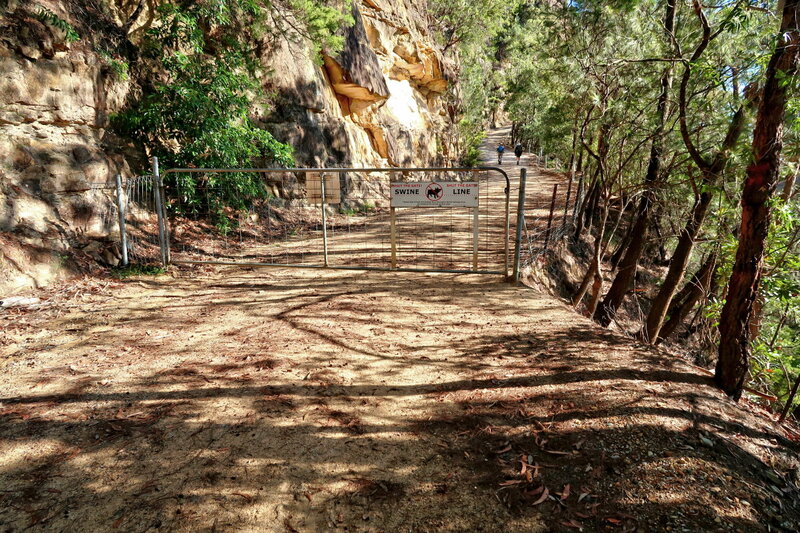 - The people on the other side are going to do some weed control, hence their car is allowed to go through the gate. 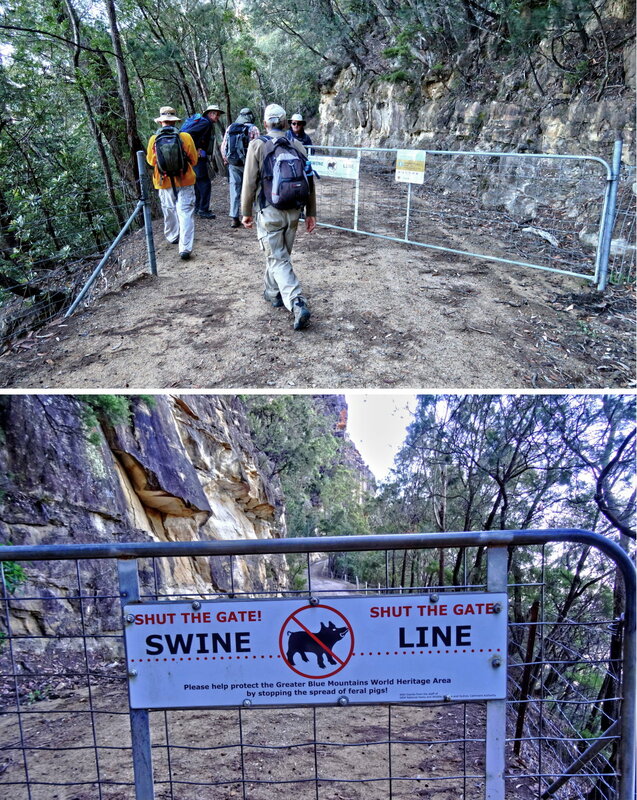 by stopping the spread of feral pigs! 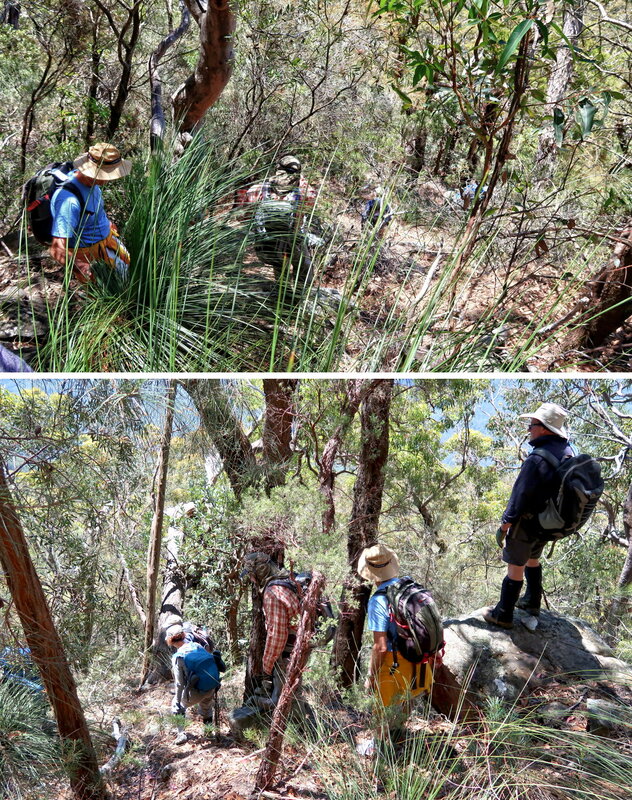 4) We've left Kedumba Valley Road and is now on a foot track to Mt Solitary. 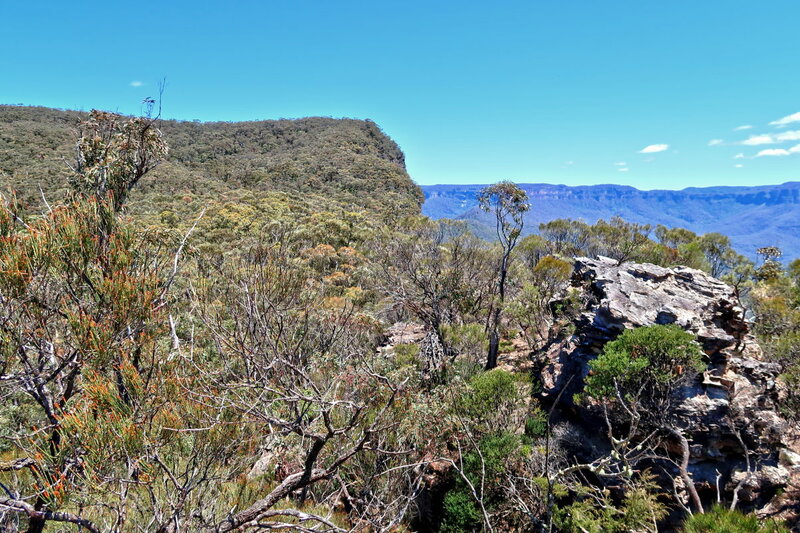 5) From the foot track, occasionally, we get a glimpse of Mt Solitary. - Miners Pass: It is the drop between the 2nd and 3rd yellow arrows. 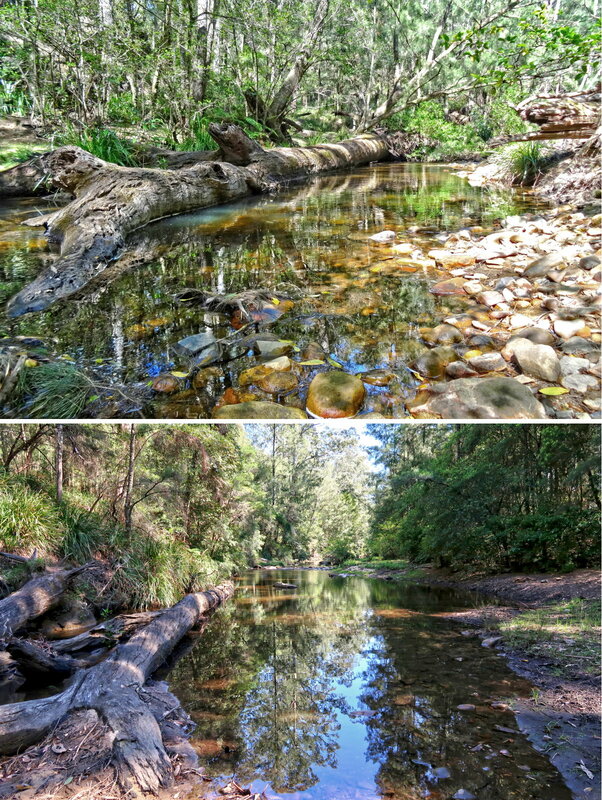 The river level is low ... We haven't had a decent downpour for a long time. 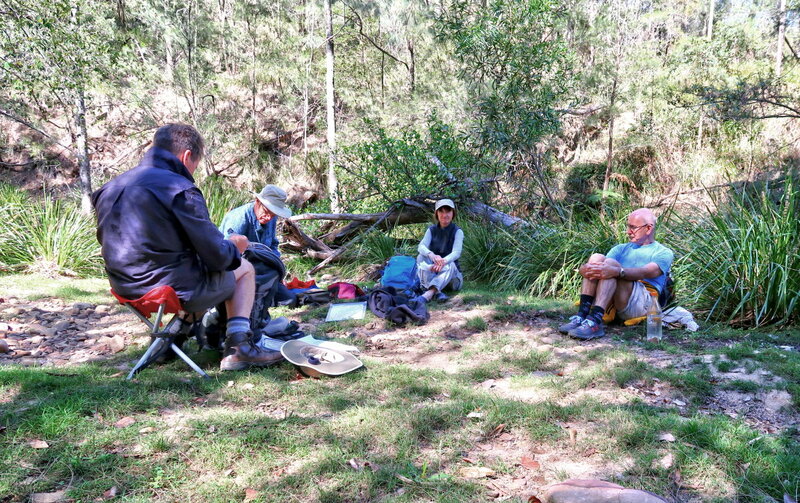 7) Here, by the side of Kedumba River, we meet up with FM and have morning tea. Morning is tea over, time to cross Kedumba River. 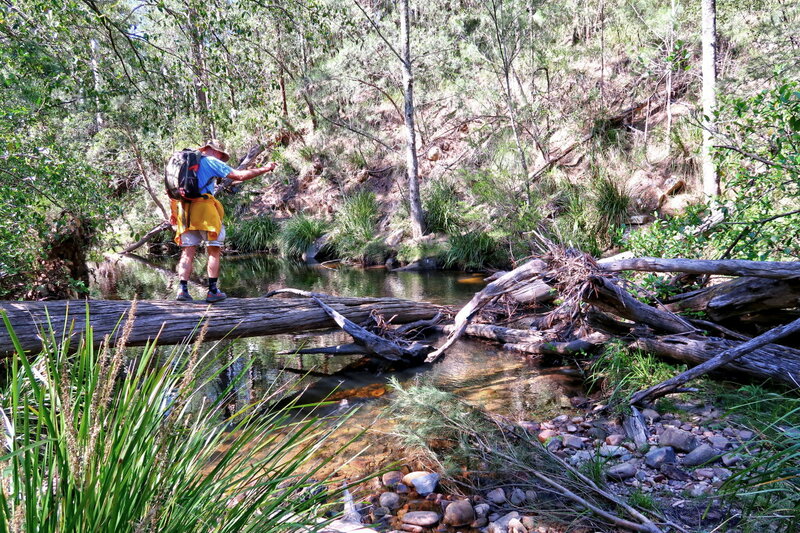 8) NC crosses the river over this log. 9) FM chooses to walk through the water. She has a pair of crocs with her for the water crossing. 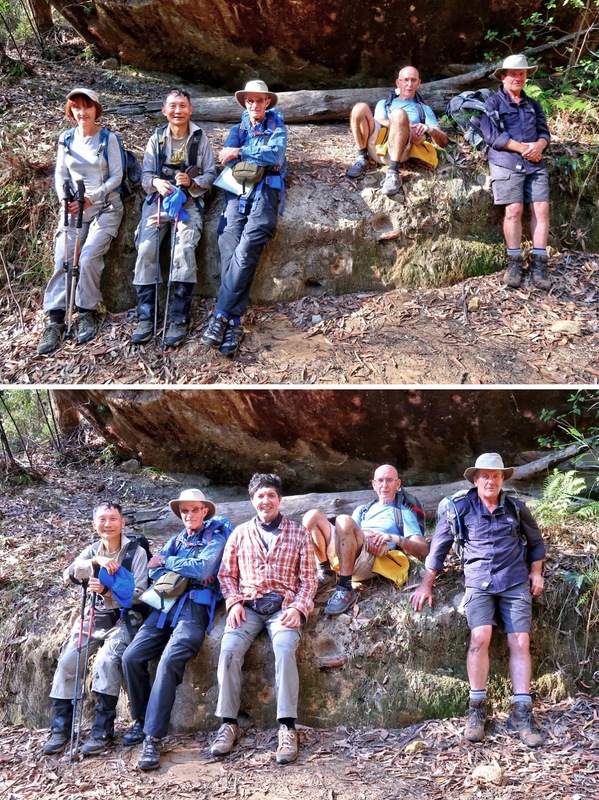 10) The rest of us walk over another log. 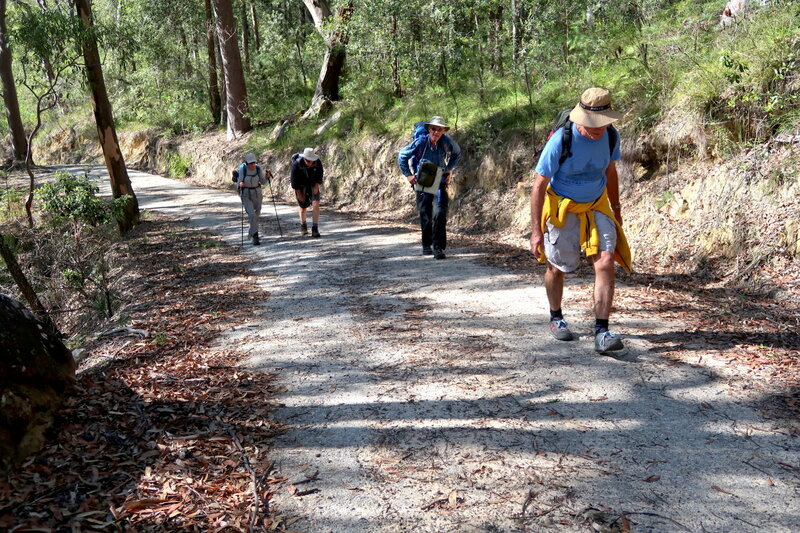 11) 1.3 km after crossing Kedumba River, we are here at the junction with Maxwells Walking Track. We won't be turning into it. 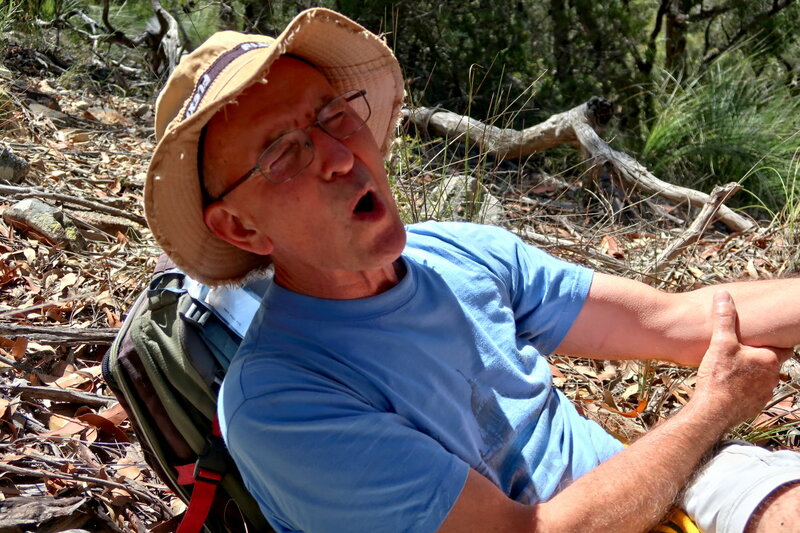 We'll continue west to climb Mt Solitary. 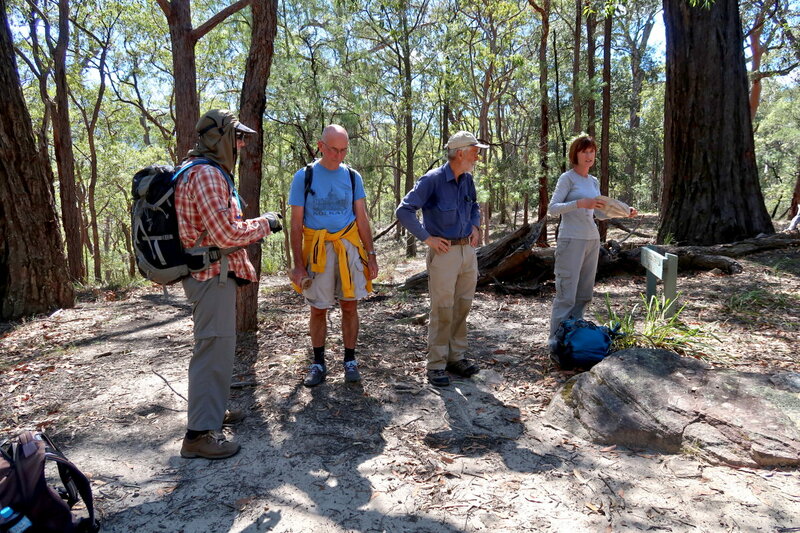 - Maxwells Walking Track is labelled in the topographic map at the start of this trip report. 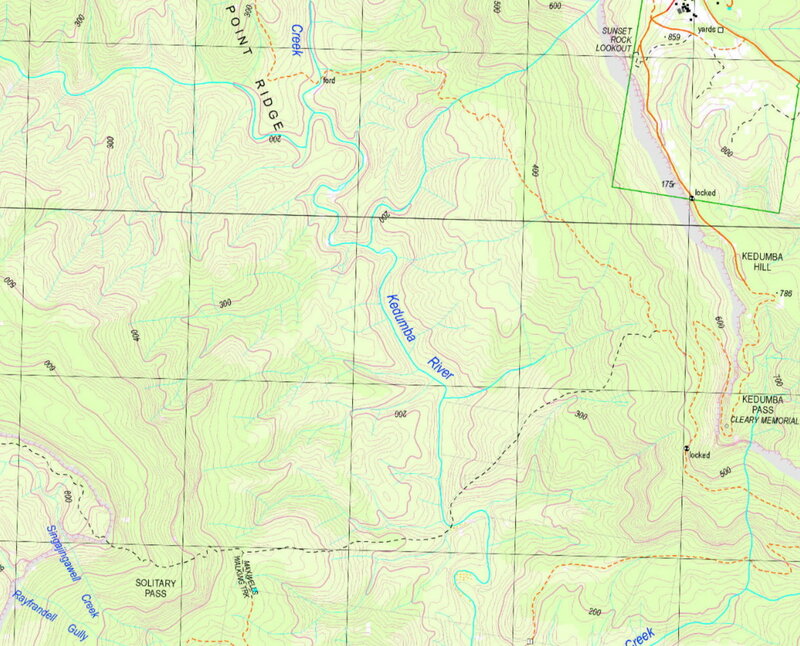 But in later edition of the map, the track is no longer labelled. From now on, the climb will be much steeper. 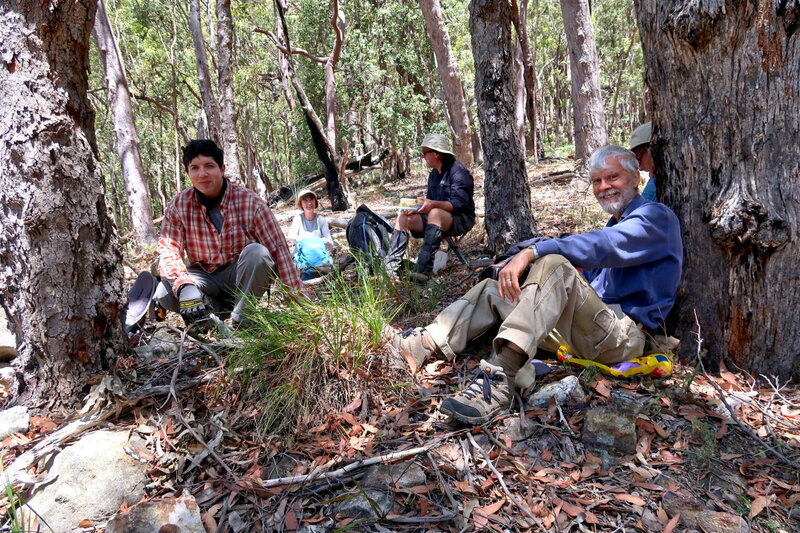 15) We come to a flat area and have a rest. - Left to right: John Fox, FM ... FM doesn't look tired at all ! 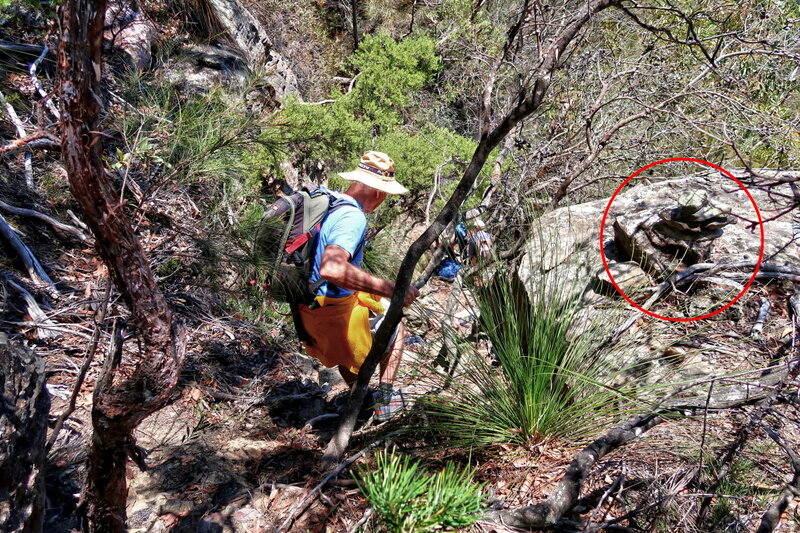 - Yellow arrow: The foot track to Mt Solitary ... another steep climb there. 16) From the flat area of the previous pic, another steep climb takes us to here, The Col.
At about 775 meters, The Col is the eastern tip of the top of Mt Soliary. 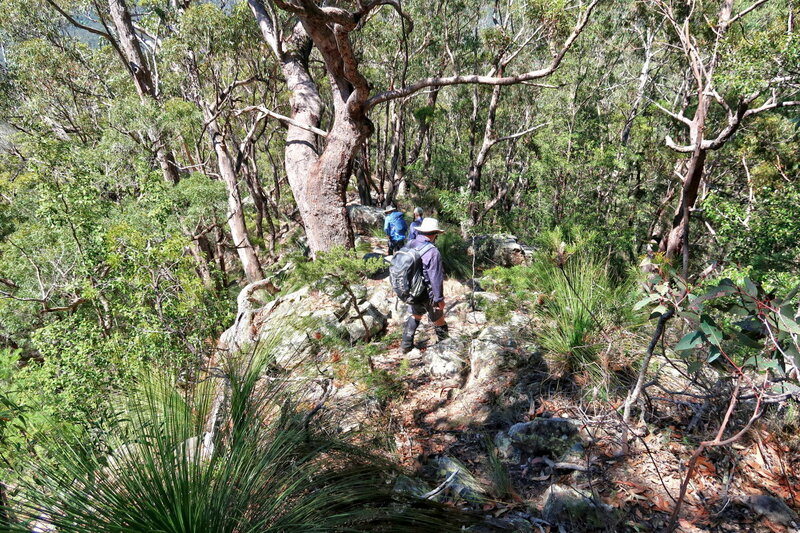 17) I am at The Col.
- The slope to the right of Rucksack point leads to Korrowall Ridge of Mt Solitary. - Right side of this pic is the background of previous pic. 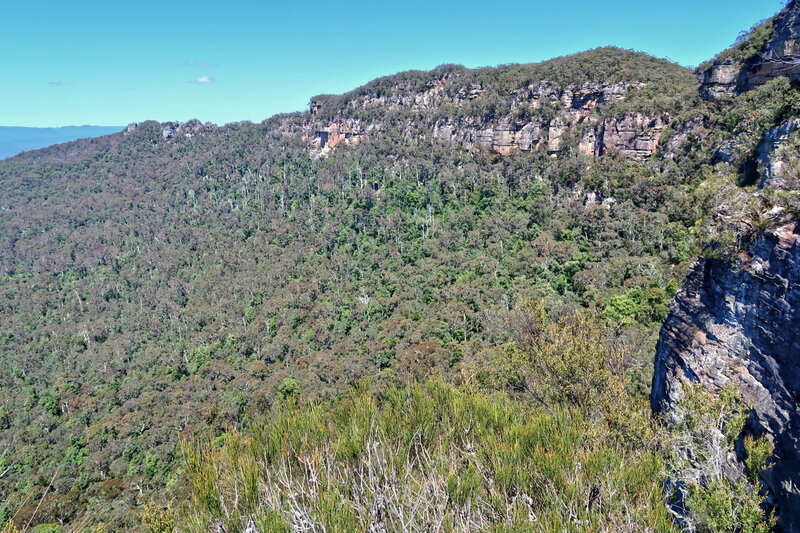 The entire mountain range in this pic is Korrowall Ridge of Mt Solitary. 20) Still at The Col ... We are taking a well deserved rest. 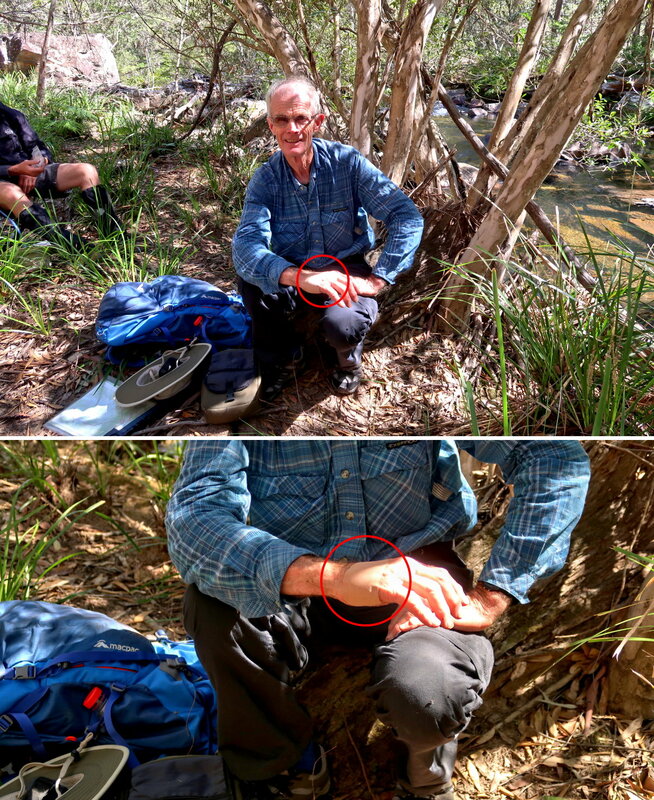 - The red circle is a metal container with a log book inside. 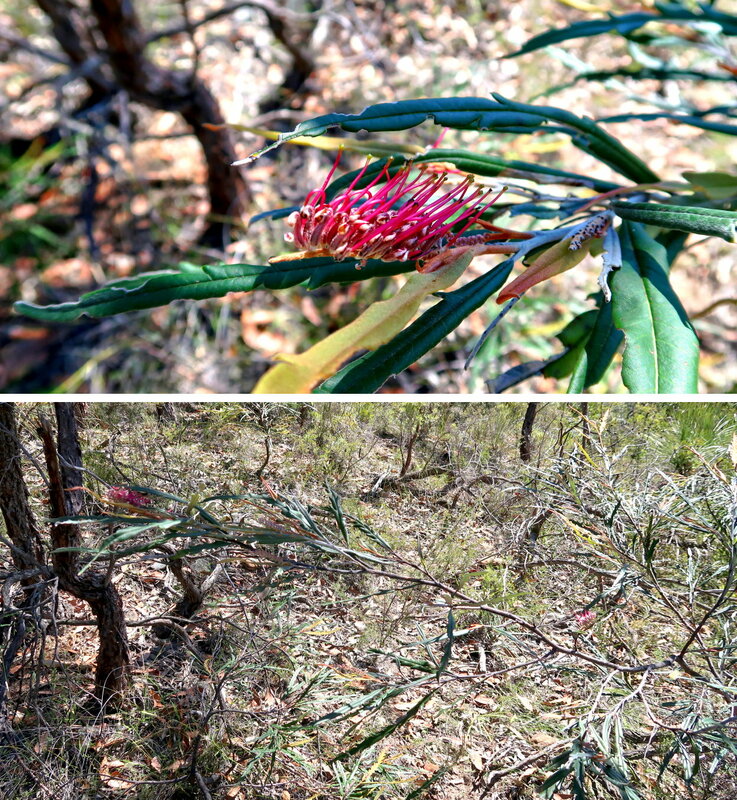 of the Gundungurra Aboriginal People. 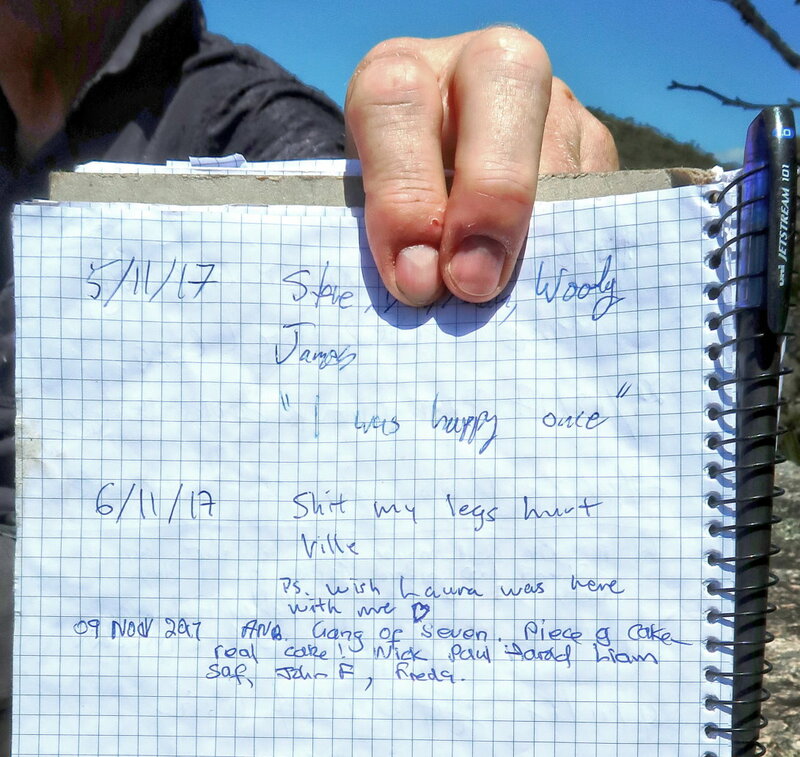 5/11/17 "I was happy once"
Haha ... not surprising ... as it is a very steep climb up the Mt Solitary slope. 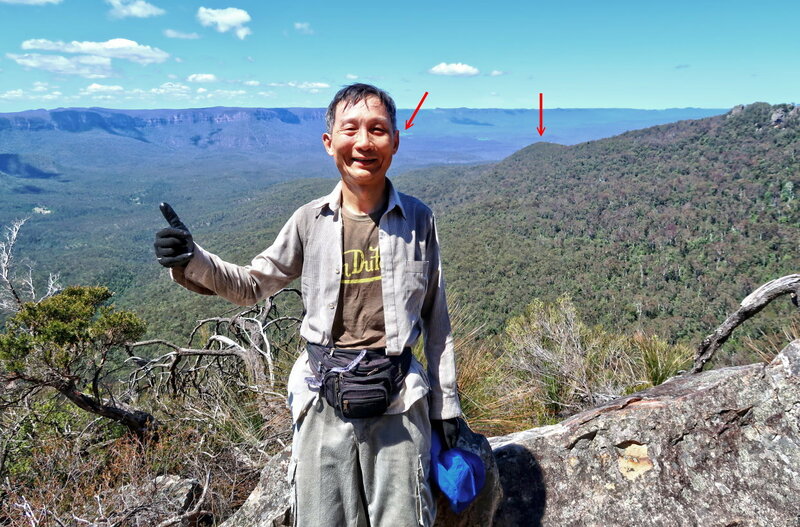 5 years ago, I climbed Mt Solitary, also from Kedumba Pass Gate. 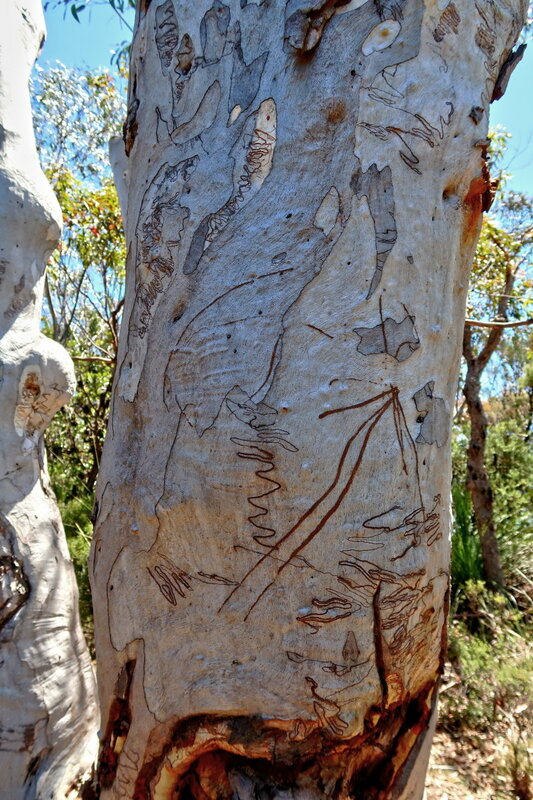 23) Scribbly Gum Moth (Ogmograptis scribula) made their tracks in this gum tree. But is the arrow man-made ? 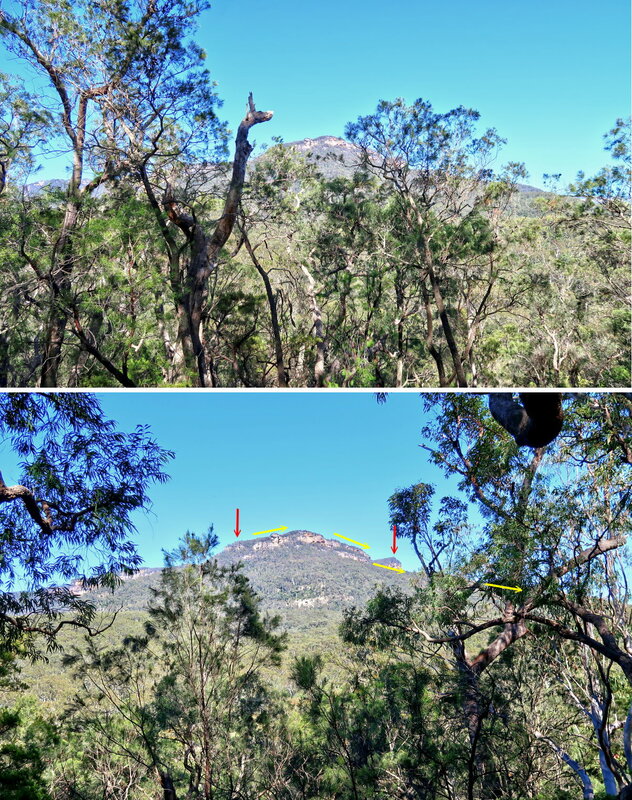 24) Along the way, we can see the middle peak of Mt Solitary, 919 meters, at the centre of this pic. We won't be going to this high point. 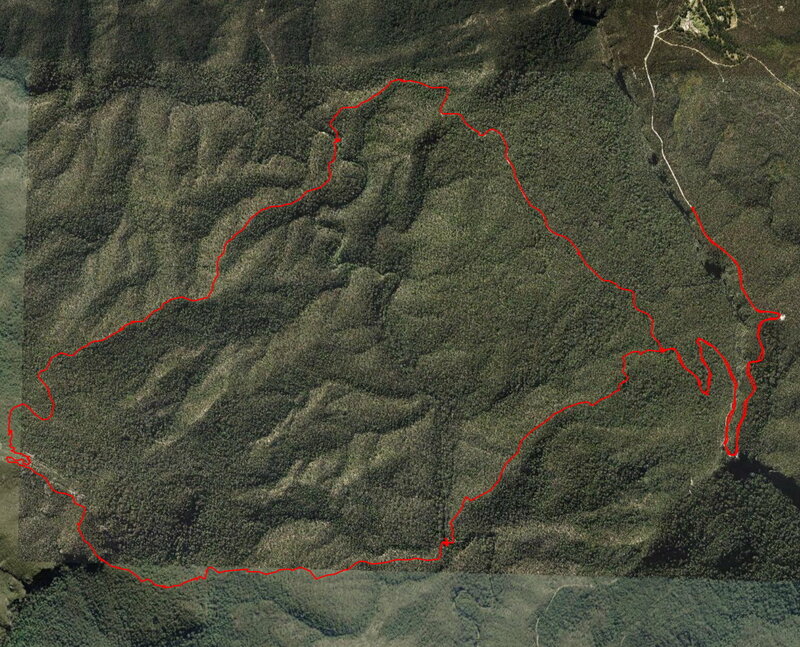 Roughly halfway between The Col and the high point, we'll turn north (to the right) to climb down Miners Pass. 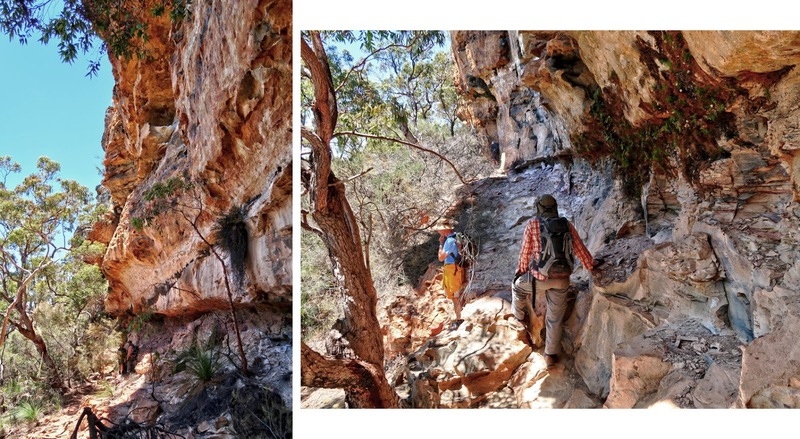 After this overhang, in another 50 meters, we'll begin our descent down Miners pass. 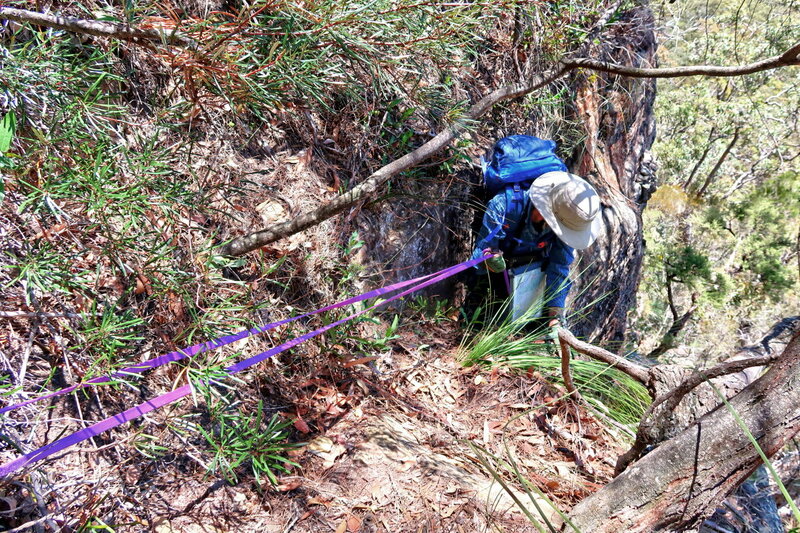 It is down this steep gully. 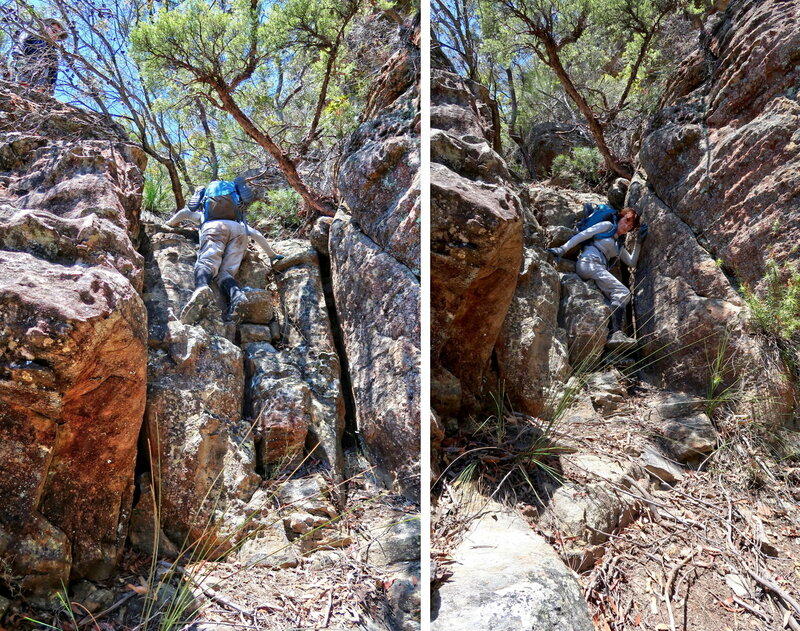 28) I've climbed down the passage in the previous pic, and now looking back at FM climbing down. 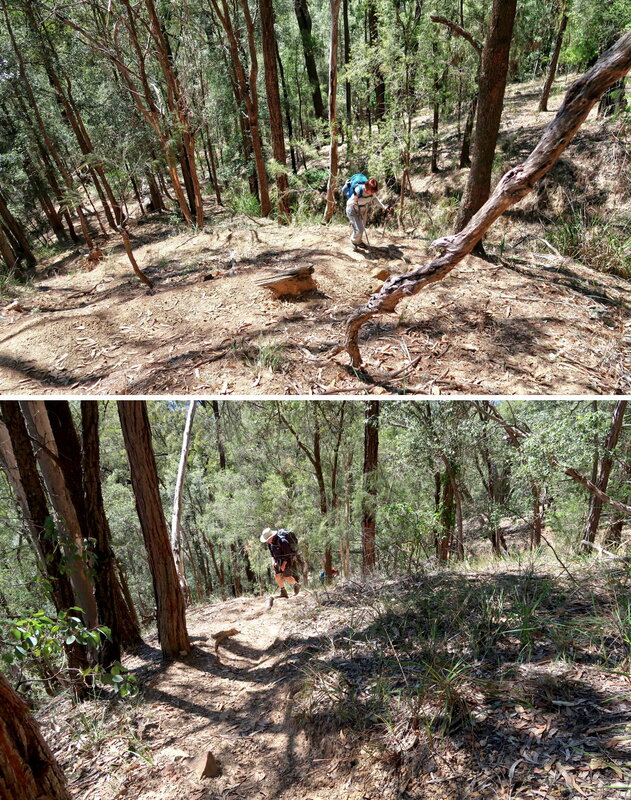 29) After the steep drop in the previous pic, we do a switchback and traverse eastward along the bottom of an escarpment. 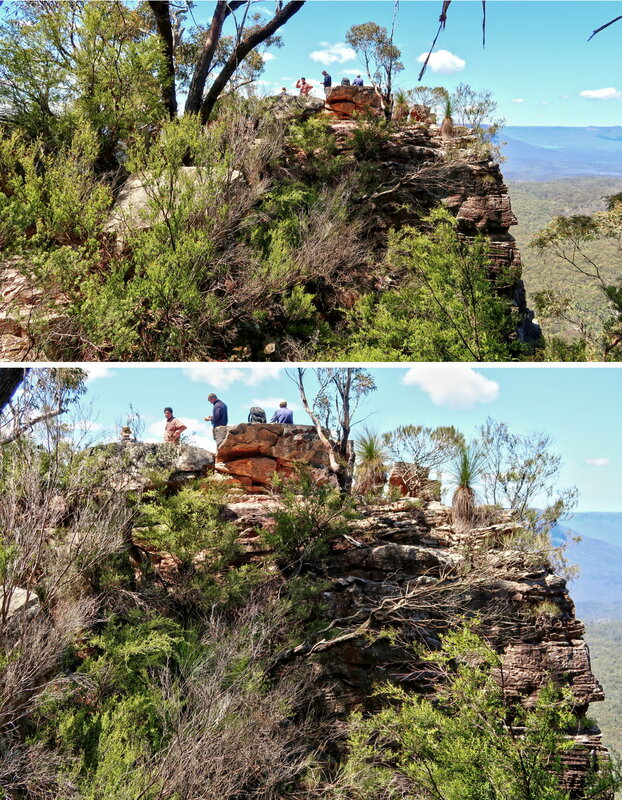 - The 2 pics below are not of the same cliff face. 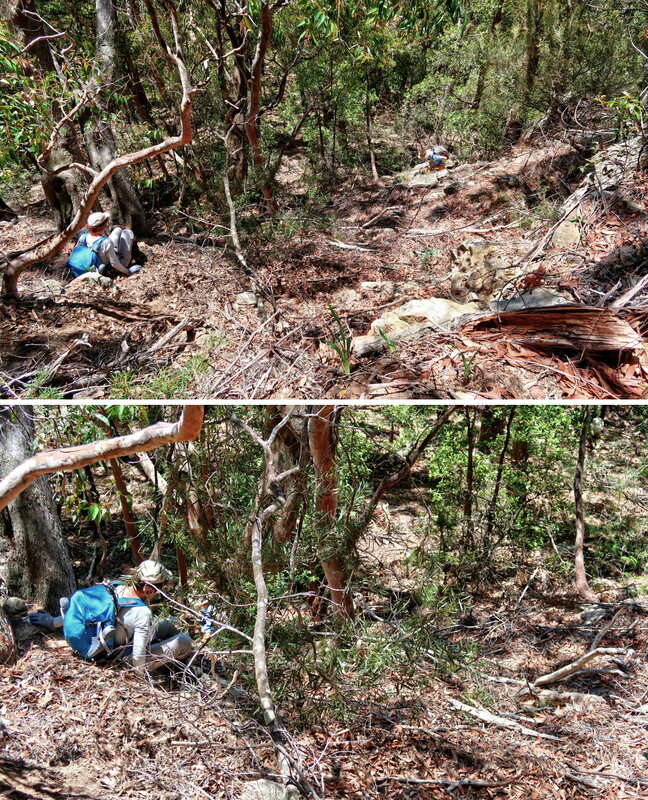 But they are not too far from each other (about 100 meters apart). 30) Then it is another steep drop ... LH is at the start of it. 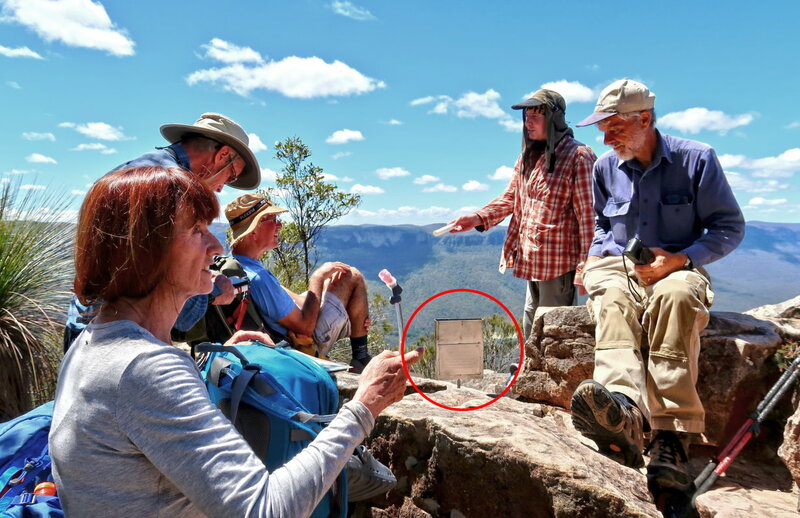 By the way, all along Miners Pass, there are cairns to guide you, like the one in the red circle in this pic. 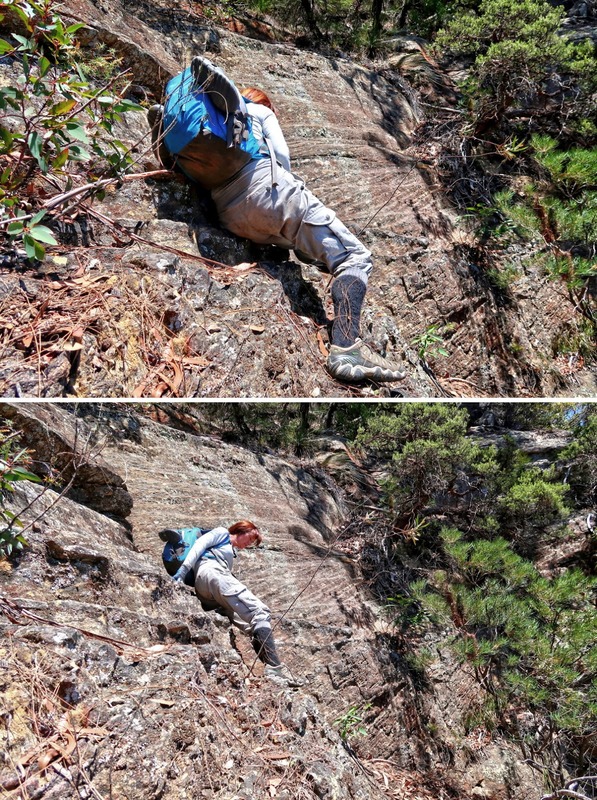 33) I've climbed down to the bottom of the rock cliff (the top of which is the previous pic); and now looking back at FM climbing down. HT has set up a tape, and now proceeds to climb down. 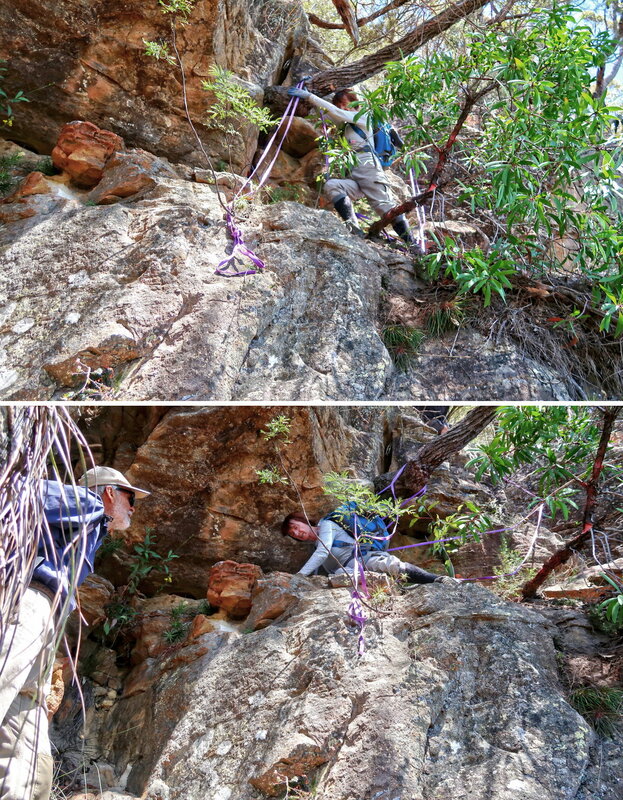 35) I've climbed down the tape; and now looking back at FM climbing down. 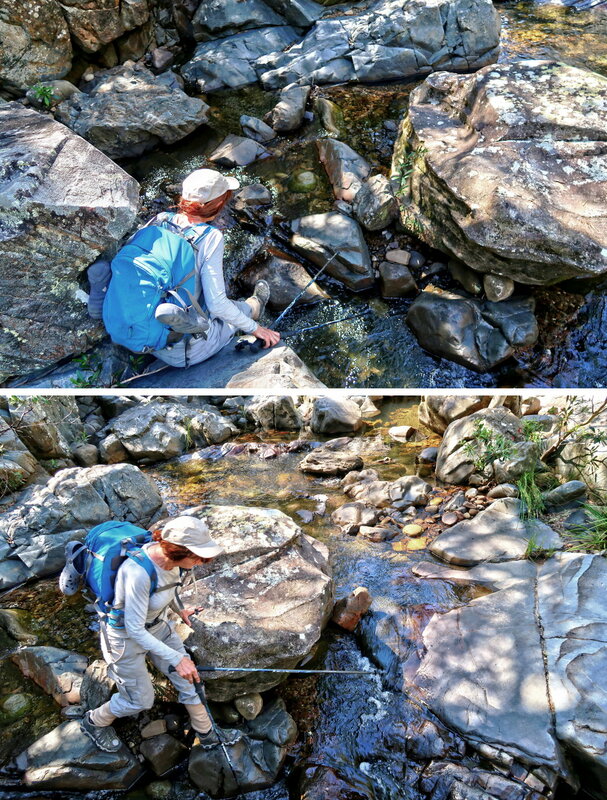 - Lower pic: It is a tricky area. We need to crawl through it. John Fox is keeping an eye out for FM in case she needs help. 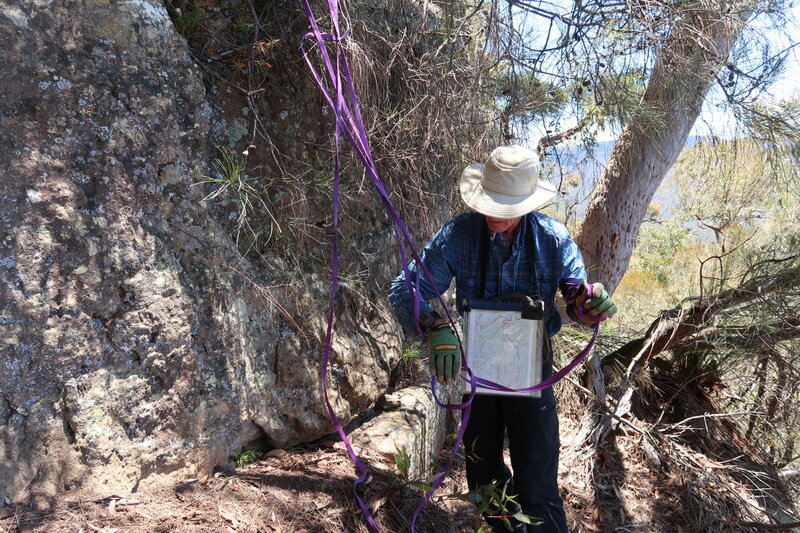 36) Everyone has climb down, and so HT is putting away his tape. 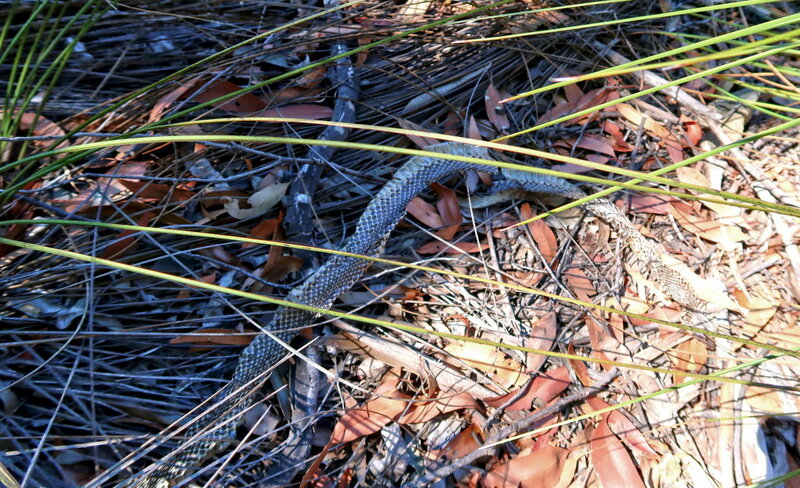 37) After the tape, it is walking along the base of an escarpment for a little while before another descent. - Red square: The lower pic zooms into the square. 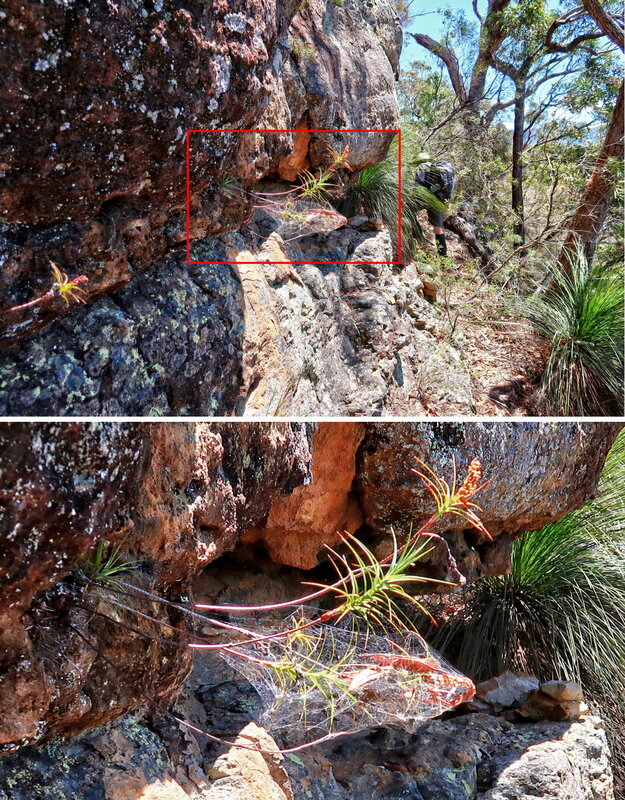 - Lower pic: This plant grows sideways out of the cliff face, how interesting ! And one of the branch is encased in a spider web. 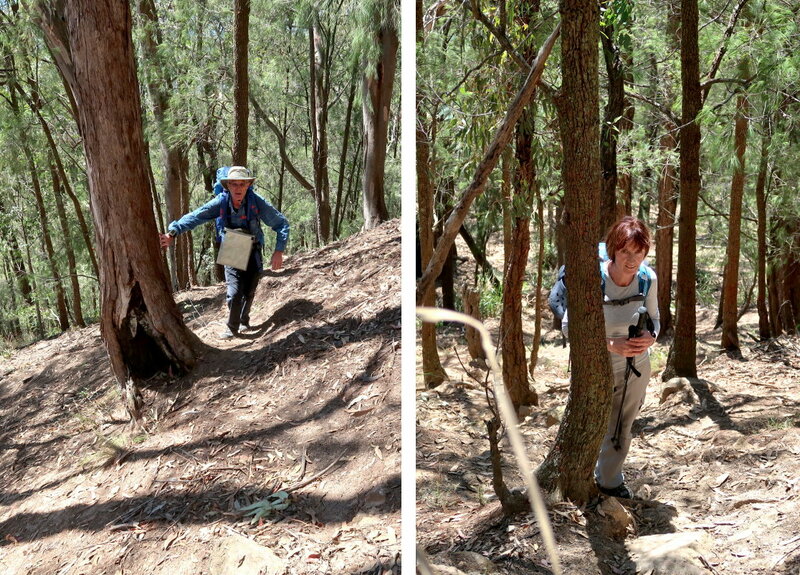 39) FM starring in this last steep descent, after which the terrain will be much flatter. 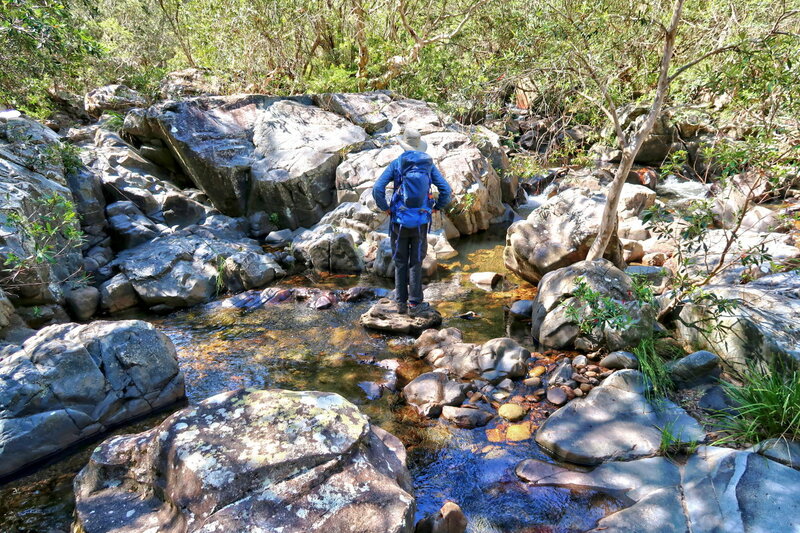 40) We've finished descending Mt Solitary; and now walking on a flatter terrain towards Kedumba River. 42) Lunch is over, back on our feet. - Like photo #40, the terrain is quite flat. 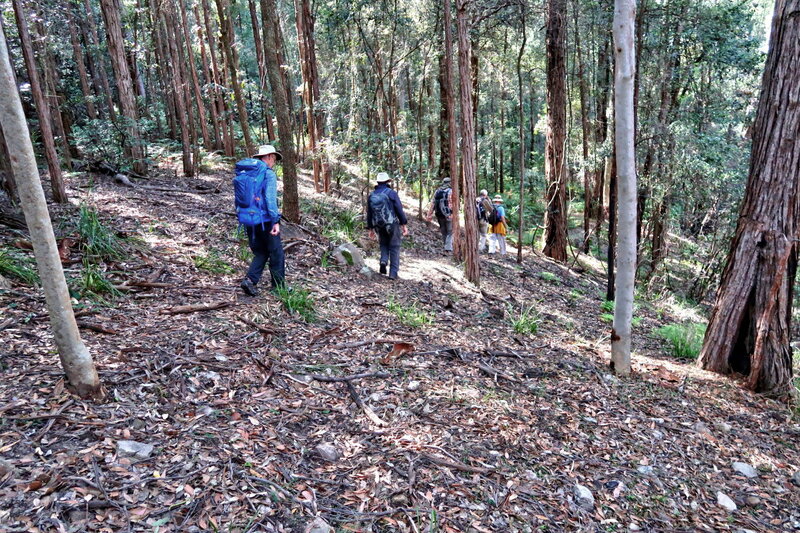 43) We walk along the top of a ridge towards Kedumba River. Most of the time it is quite flat as shown in the previous pics. Occasionally, here for example, it is like a razor blade. We can see the slope dropping off on both sides of the ridge. 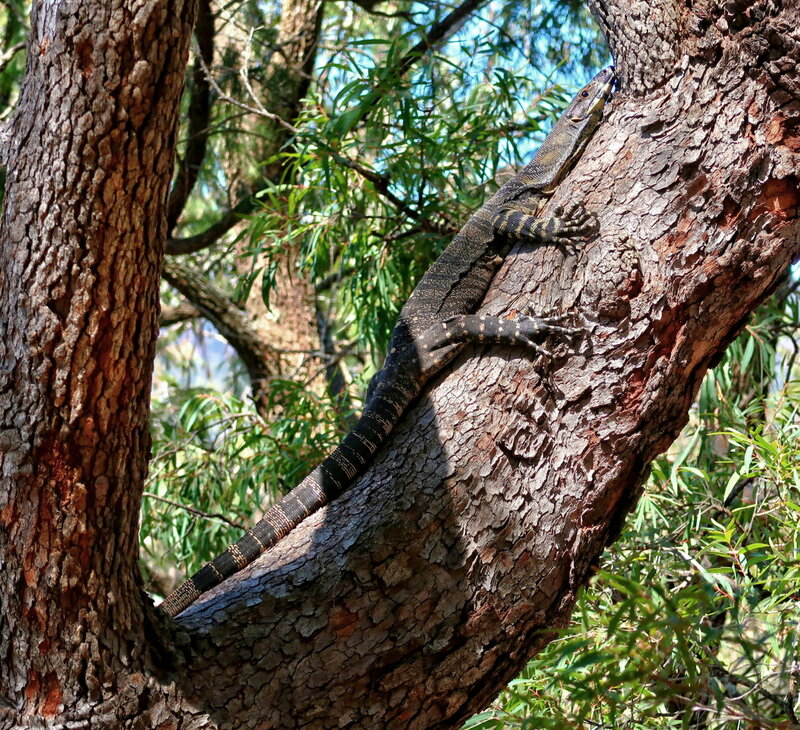 Even a Lace Monitor (Varanus varius) comes out to investigate NC's hand. 50) We reach Kedumba River ... FM is crossing it now. 51) I am at where FM was in the previous pic, and looking at HT ahead of me. We have afternoon tea by the side of the river. 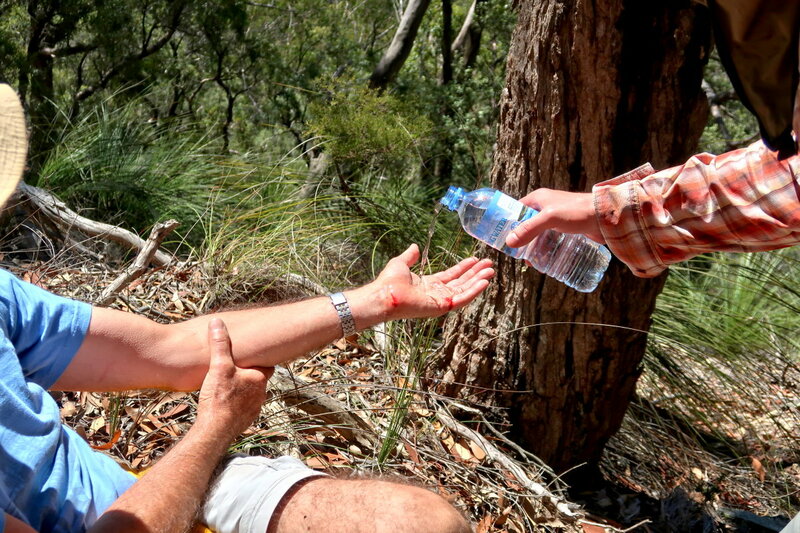 52) HT also has a superficial scratch on his hand and was promptly attended to by Saf. You just have to love NC's colourful shoe. 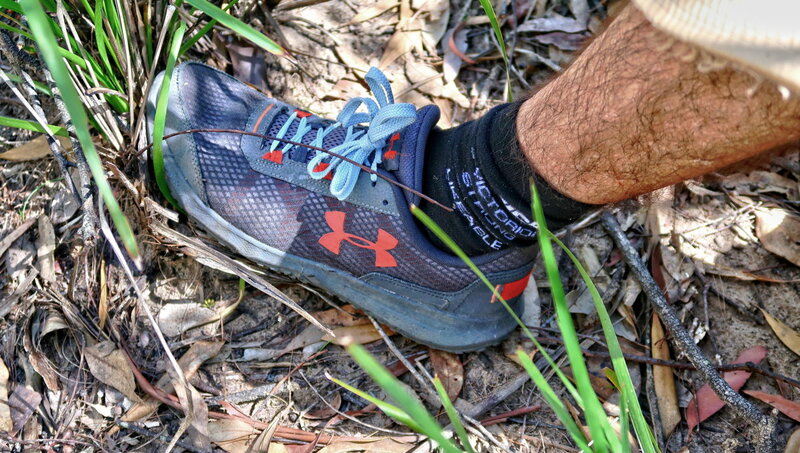 The shoe lace was bought separately to match the colours ! 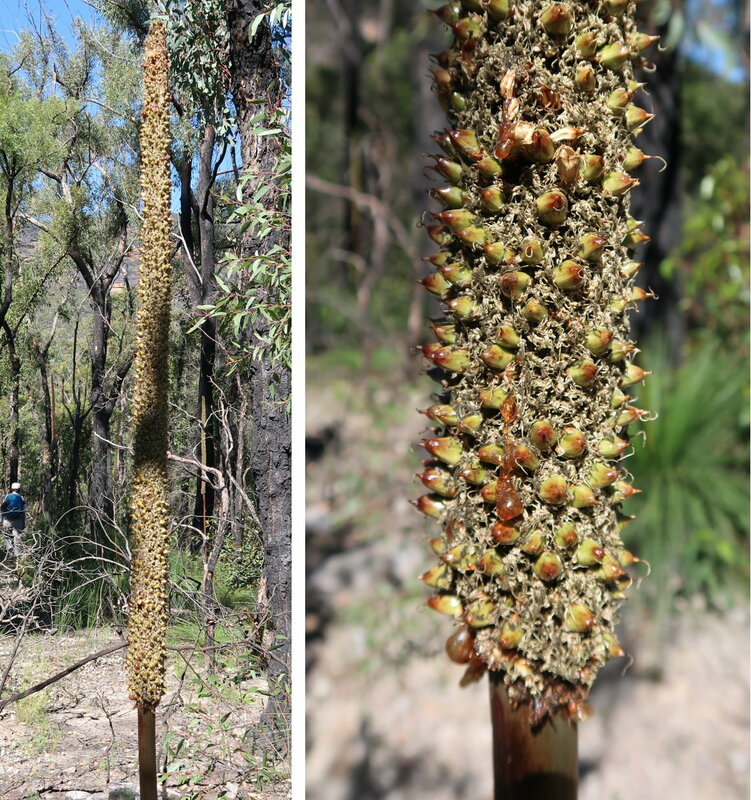 54) Grass Trees are blooming at this time of the year. 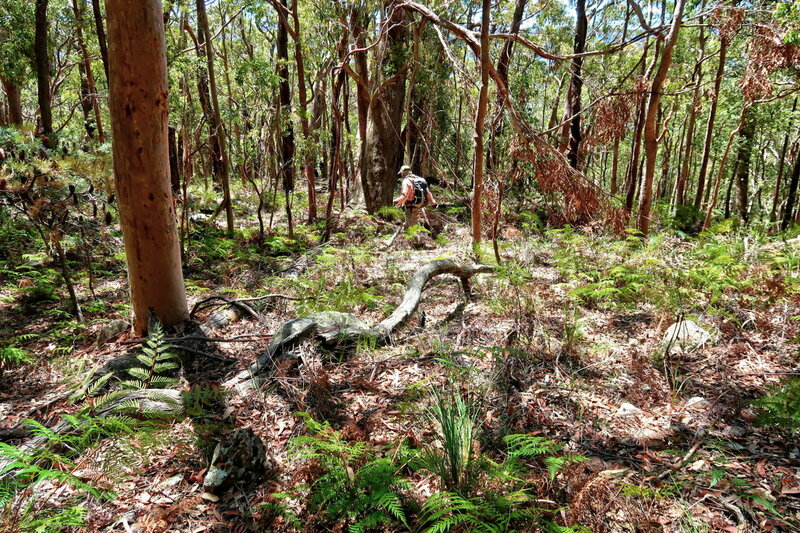 55) We are now on Kedumba Valley Road, west of the junction with the foot track to Mt Solitary. 9 hours after we started this morning, we are back at the carpark by the side of Kedumba Pass Gate. 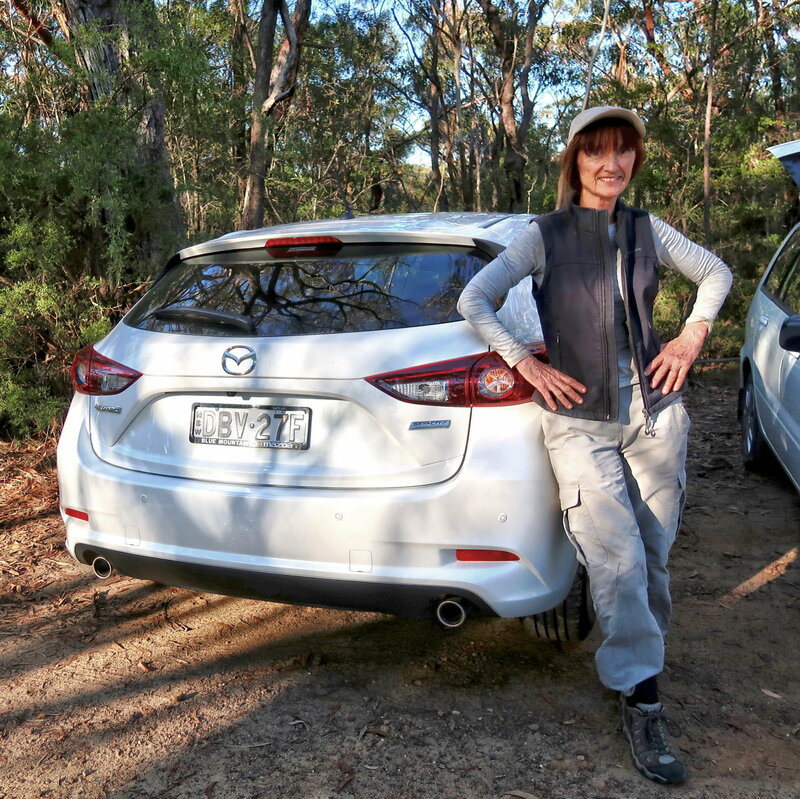 58) FM is with her brand new one week old car. It's a surprise she is willing to drive it on a dirt road to here. 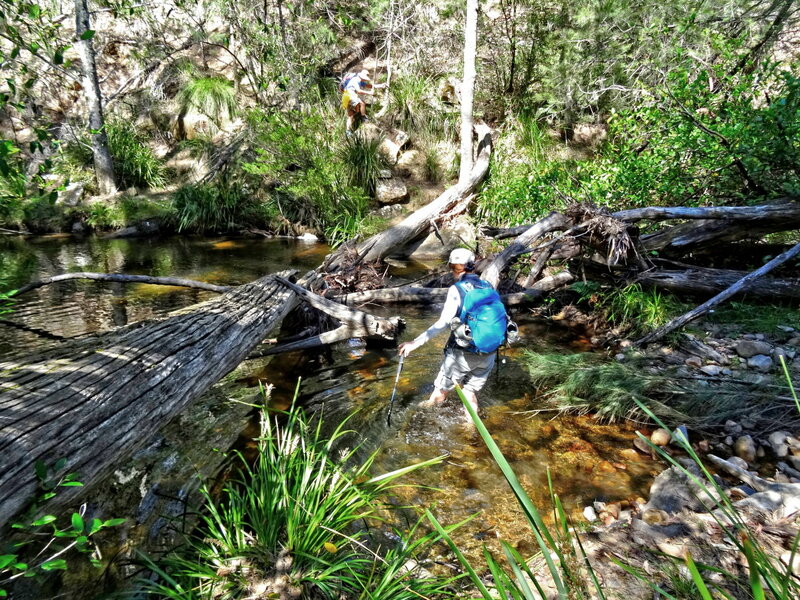 Ah, the passion for an adventure out weighs everything ! Many thanks to HT for leading. His navigation skill is superb.